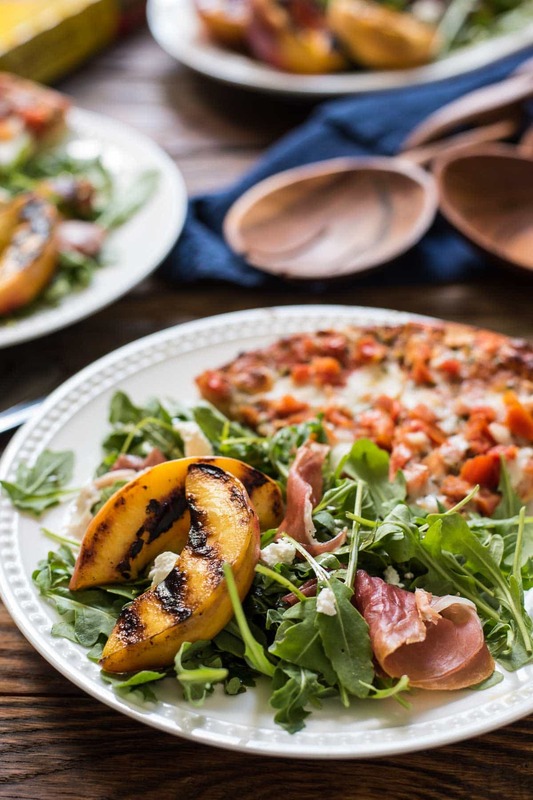 This Grilled Peach Salad combines arugula, goat cheese, and prosciutto with juicy grilled peaches and a tangy balsamic dressing for the ultimate summer salad. In my cupboard sits two matching sets of nested mixing bowls I bought at Costco. They’re the perfect size for all kinds of kitchen tasks, and because they have lids, they’re also my go-tos for toting side dishes to potlucks or get togethers. I used and loved my first set so much, I bought a second. I never thought having two identical sets could be a problem until one fateful night a few weeks ago when I had a serious mom-brain moment. Earlier in the day, I had whisked together the dry ingredients for giant bakery style chocolate chunk cookies in one of the bowls, popped the lid on and set it on the counter. Then, I prepared this delicious Grilled Peach and Prosciutto Salad. I popped the lid on that bowl and slid it into the fridge. Later that evening, I pulled the bowl out of the fridge just to make sure I wouldn’t forget it as we were flying out the door to head to a family potluck. You see where this is going, right? In our rush, I grabbed the wrong bowl off the counter, leaving my poor salad behind. I didn’t realize my mistake until we got to the party, and I handed the bowl over to my mom to set out. She came back after a minute with a bewildered look on her face and asked, “What kind of salad did you say you made again, Courtney?” I told her. With a questioning eyebrow and a bit of a giggle, she opened the lid of the bowl to reveal a mound of flour, baking soda, and a lone measuring spoon. I had to inform her that no, eating raw flour as a salad was not some sort of new trend, and in fact my salad was sitting at home all by its lonesome. We all had a good laugh about it but I did owe my family a taste of this salad at a later date. As it turns out, it paired perfectly with a Gluten Free Margherita Pizza from California Pizza Kitchen that everyone (including my gluten intolerant mama) could enjoy. 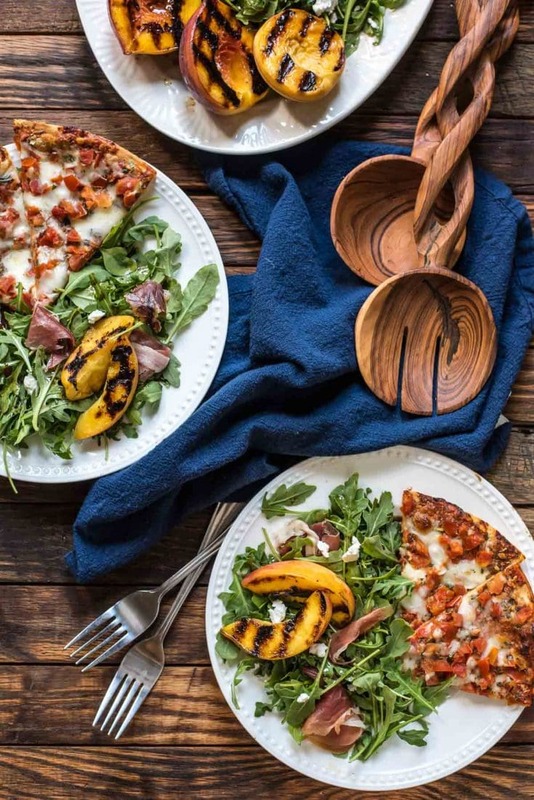 On busy weeknights, I love being able to pair a frozen pizza with a healthy side dish for a quick and balanced meal. CPK’s Margherita Pizza has a crispy thin crust, vine ripened tomatoes, mozzarella cheese, and fresh basil…so basically the flavor is SUMMER. 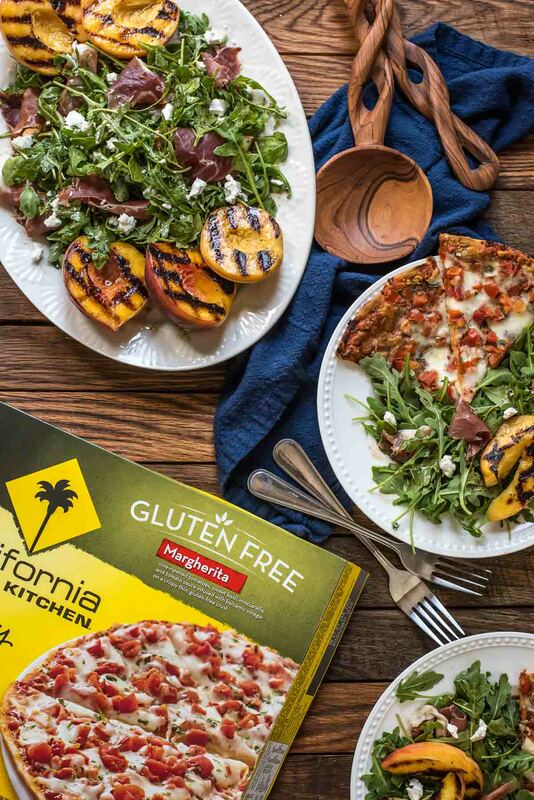 I paired it with the ultimate summer salad, loaded with juicy grilled fresh peaches, crumbled goat cheese, and prosciutto over a pile of peppery arugula leaves. 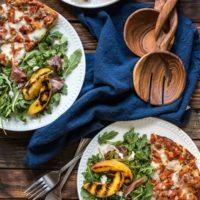 With a tangy balsamic vinaigrette, and just the right balance of sweet, smoky, and savory, this is definitely the salad you’ll want to tote along to all your summer gatherings. Just make sure you grab the right bowl! Preheat the grill to medium high heat. 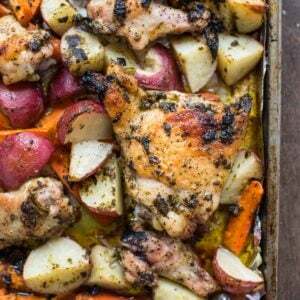 Alternatively, heat a grill pan over medium high heat on the stove. Halve the peaches and remove the pit. Brush the halves with butter then place them flesh side down on the grill grates at an angle. Grill for 2-3 minutes or until grill marks have appeared. Place at the opposite angle and grill for an additional 2 minutes. Remove peaches to a plate. Slice, if desired. 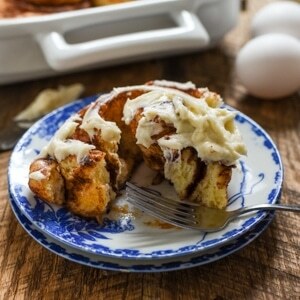 In a small bowl, whisk together the oil, vinegar, and honey until well combined. Add salt and pepper to taste. Toss the arugula with the vinaigrette mixture, reserving a few Tablespoons for the end. 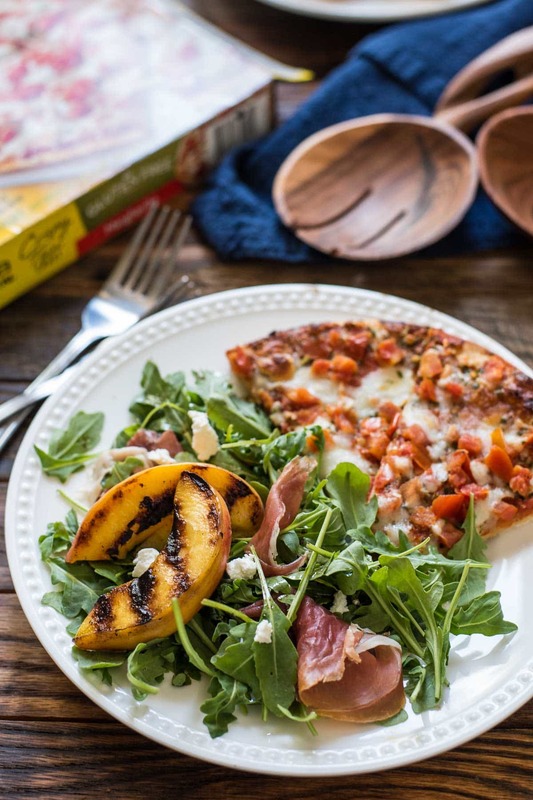 Toss the goat cheese and prosciutto with the arugula. Arrange peach halves or slices around the outside. Drizzle with the remaining dressing. Serve immediately. The peach salad looks incredible, need to make a salad for a BBQ on the weekend and think I might have to try this one! Perfectly timed blog post. I never thought about grilling fruit for a salad, but maybe I should! Looks great! It definitely adds that extra sumpin sumpin! I like to grill enough to have some for dessert with ice cream too!